Whether it is a wooden hot tub, a swim spa, or an inground hot tub there are several health benefits associated with using a hot tub spa. These benefits include improved sleep, reduced stress and anxiety, reduced joint and muscle pain and soreness, lower blood sugar and blood pressure, and the decreased frequency of migraines. The hot tub experience is meant to relax you and help melt away all the stress and pain from the day and, along with all the health benefits, they also make a great addition to any backyard entertainment area. Just like with pools, however, certain aspects need attention when it comes to the safety and liability you face while owning a hot tub. If you are entertaining in your backyard oasis and allow your guests to use the hot tub, you want to be ensured that they are safe and they do not slip or fall while attempting to get in and out. 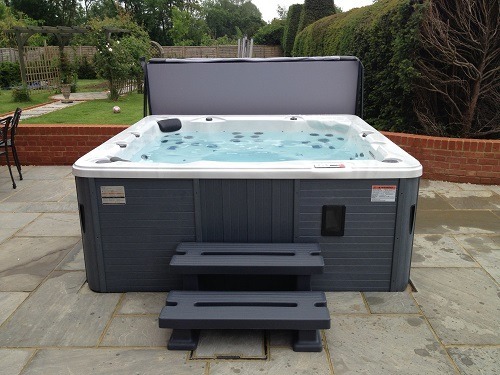 As well as a quality hot tub deck and hot tub cover for added protection in the cooler weather, quality hot tub steps are also very important. Hot tub steps make it easier to climb in and out of your hot tub spa and also ensure safety. There are many different types of hot tub steps that can be purchased, and it is fairly easy to choose from this variety to match with your overall needs and the design of your spa hot tub. 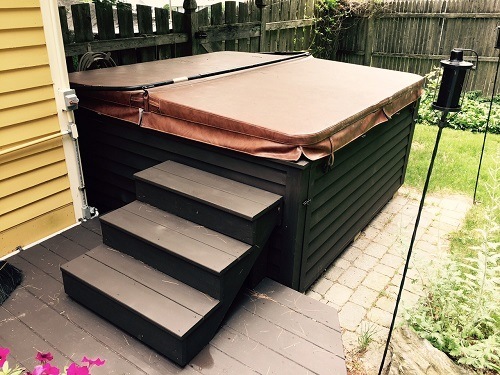 There are hot tub steps that provide additional storage features, steps with handrails for added security, and wooden spa steps that can fit any size spa, including ﻿rou﻿﻿nd hot tubs. The steps can be made from a wide range of different materials other than wood, including plastic. Hot tub steps provide accessibility, safety, beauty, and durability. They limit any potential liability while you are entertaining in your outdoor space because they offer an easier and safer way to gain access to the hot tub. They are durable and can sustain being indoors and outdoors and usually require very little maintenance, and they add that extra beautiful touch to a backyard oasis while offering convenience. The Leisure Accents Spa Step with Storage Compartment is the perfect complement to any spa and comes in the neutral colors of gray and beige to mix in with any design or style of the spa. It is constructed with a high-quality resin material and can withstand up to 300 lb of pressure being placed on the steps. These steps are also weatherproof and UV-resistant and can easily be cleaned with soap and water. There is no assembly required, and it is durable and strong enough to last you for years to come. 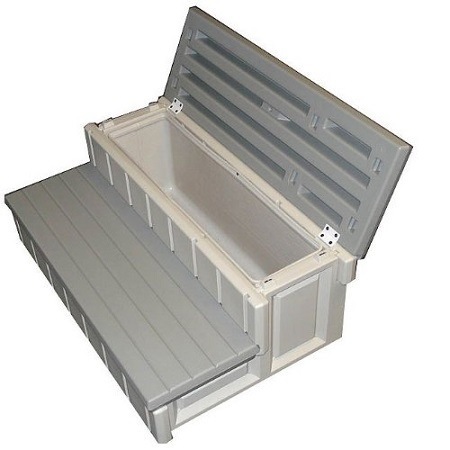 The top storage compartment can also double as a cooler which makes this item convenient and multifunctional and works well in any outdoor space. 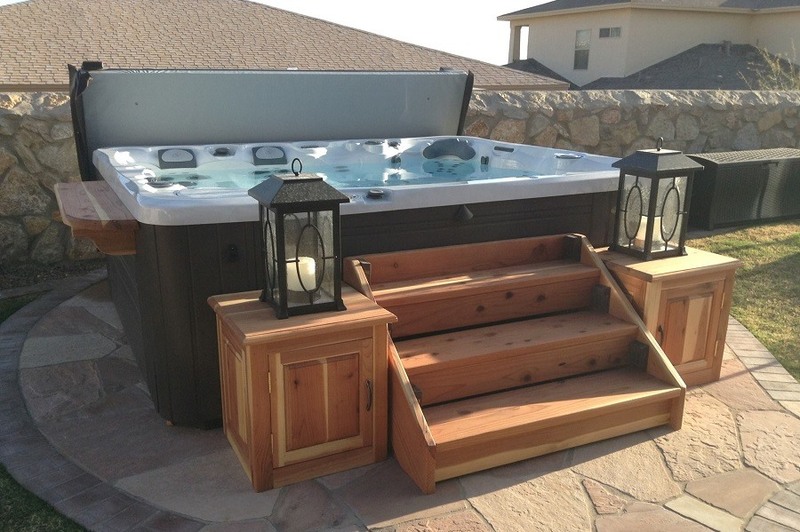 Hot tub steps with storage compartments are useful because they can be considered multifunctional. Along with the added safety, you are provided with convenience and style for a reasonable price. The biggest drawback is in the assembly process due to some of the pieces not snapping together properly. It is also advised that you do not store chemicals in the storage compartment which is one of the reasons people purchased it in the first place. My suggestion would be to use the storage compartment to hold towels or other smaller accessories you will need while being outside. The Lifesmart Matching Mahogany Steps are made to work with the Jewel, Hydromaster, and Grandmaster spas. They make it easy and safe to get in and out of the hot tub with ease, and the additional non-slip tread design adds safety to the over design. They are constructed of a solid permalast plastic construction that requires no maintenance whatsoever. There is no assembly required, so it is good to start using as soon as you get it home. One of the most important aspects of hot tub steps is that they are sturdy and can safely withstand the weight of the individual to gain safe entry to the hot tub. These steps are well built and can hold a considerable amount of weight and added pressure. The biggest drawback customers have found is the coloration and how it appears a bit lighter than how it is portrayed in the pictures. 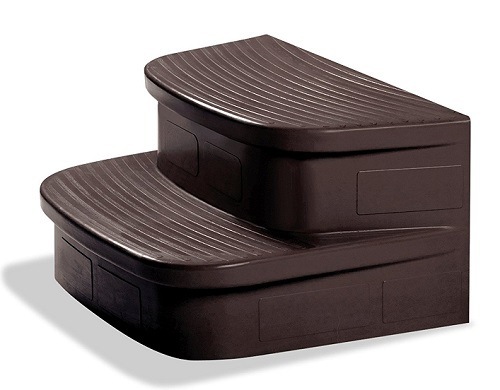 Confer Plastics Handi-Step is suitable for indoor or outdoor use and can support up to 300 lb. It can be easily assembled without the use of any tools: soap and water are all you need to clean it. It is made of sturdy and durable resin construction and is the perfect addition to any spa whether it is a straight-sided spa or a rounded spa. The biggest drawback is the assembly process that can take up to 20 minutes. These steps are the perfect replacement for the old wooden steps you may have outside of your hot tub. The all-plastic construction makes them weatherproof and they are UV-resistant, so they can stand being in the sun. Customer testimonials settle on them being a great product for the money and a long-lasting investment. The Lifesmart Matching Sahara Spa Steps match perfectly with the Simplicity Spa and can complement a brown cabinet nicely for the perfect set up and additions to your spa area. The permalast construction is strong and durable and requires no additional maintenance, and the steps come assembled and ready to use. 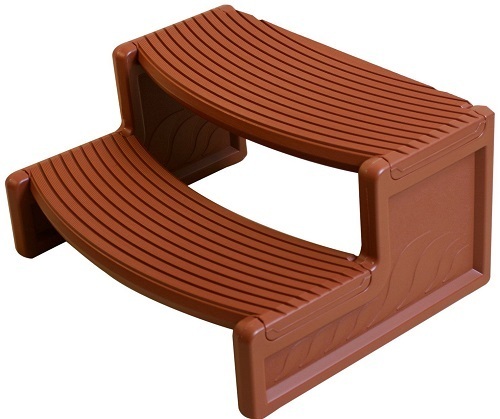 These steps come in a designer Sahara color and are stylish, affordable, and safe. The biggest complaint with these steps is the coloration of the product differing from what is pictured. 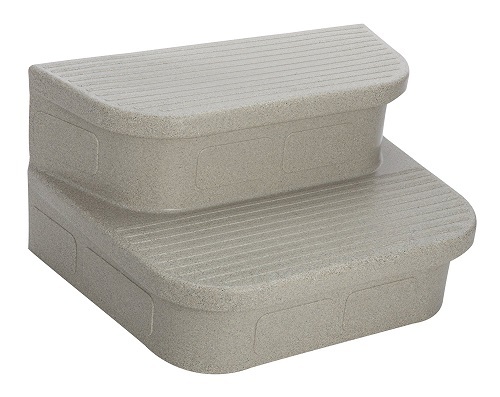 These hot tub steps have the ability to withstand a lot of weight and pressure being placed on them, and the very neutral color makes them a perfect fit for a variety of hot tubs. The storage is convenient, and they can even be used for above ground pools, so they are not limited to hot tub use only. 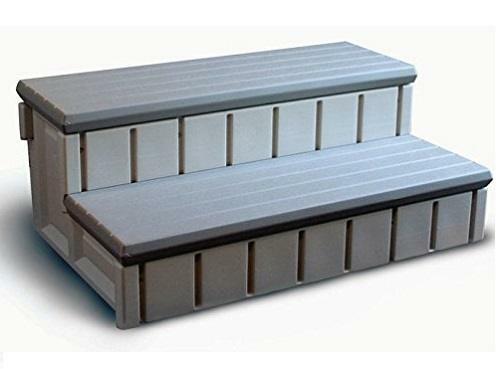 Confer Plastics Spa Steps are constructed of a resin material that requires little to no maintenance and has a storage compartment that is perfect for stowing away your spa accessories. The steps come fully assembled and are a neutral and attractive gray color. They are a free standing unit that is sturdy and solid but like with any spa steps; you want to be careful when you climb them in case they pull away from the side of the spa. They are easy to move, and the storage compartment is convenient. The only downfall is the assembly aspect. The product says they come fully assembled but many customers have complained about the difficult assembly, and some had issues getting the plastic tabs into the locked holes, but they were happy with the finished product. Overall, these hot tub steps are a good value for the money. The convenient storage is excellent, and the design is strong and durable. The resin construction makes it easy to maintain with little to no upkeep to keep them looking good for years to come. The Leisure Accents Sp﻿﻿a Step with Storage Compa﻿﻿rtment provides all of these key features and comes at a very affordable price. Hot tub steps are beneficial when it comes to the safety and ease of getting in and out of the hot tub. I recommend reading the manufacturer’s recommendations and cautions before using the product and also be aware of any weight restrictions that may be put on the steps. Most steps are sturdy enough to hold up to 300 pounds of weight safely. Also, beware of the steps pulling away from the side of the hot tub when you are exiting. The spa steps do not connect to the walls of the hot tub so they may shift over time. Finally, always read customer reviews and testimonials before purchasing any product. Some of the steps in this review featured no assembly but after reading the customer reviews, we did see that there may be some assembly required. Another note of useful information comes with the coloring of certain products. What you see in the pictures may not necessarily be the color you will receive. 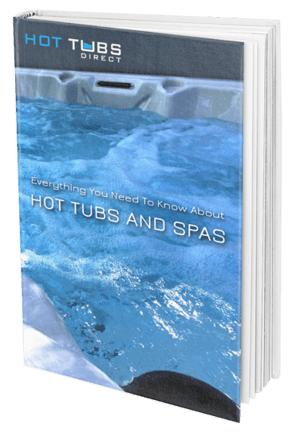 The above is a helpful guide that showcases some of the most top rated hot tub steps available on Amazon. The guide makes it easier to compare each product and help you decide which design and style will best suit your needs. Providing customer reviews and recommendations will lead you in the right direction when you are in search of the most affordable, stylish, and safe hot tub steps that are available. My recommendation would be to purchase steps that are wider and provide that additional storage compartment for your convenience. You can keep all spa accessories together and in one location and the resin construction makes them easy to clean and able to withstand any weather conditions while still lasting your family for years to come with very little maintenance.